Straight from one of my favorite scenes in Cars 3, here we have the Mattel "Deluxe" size 1:55 scale diecast of Dr. Damage! For me, the most fun characters to collect so far in the Cars 3 line have been the demolition derby/crazy 8 race contenders. They're just so wacky and odd, which make for diecasts unlike any that have been released in the past! Plus they have some amazing detailing with all their "dirt" and "grime." The character design for this one is just too funny and Mattel did a fantastic job translating it into a diecast toy. I mean, come on... "Dr. Damage"? "Rambulance"? That flat line graphic? I imagine all the concept artists had a blast working on that scene during the production of the film. 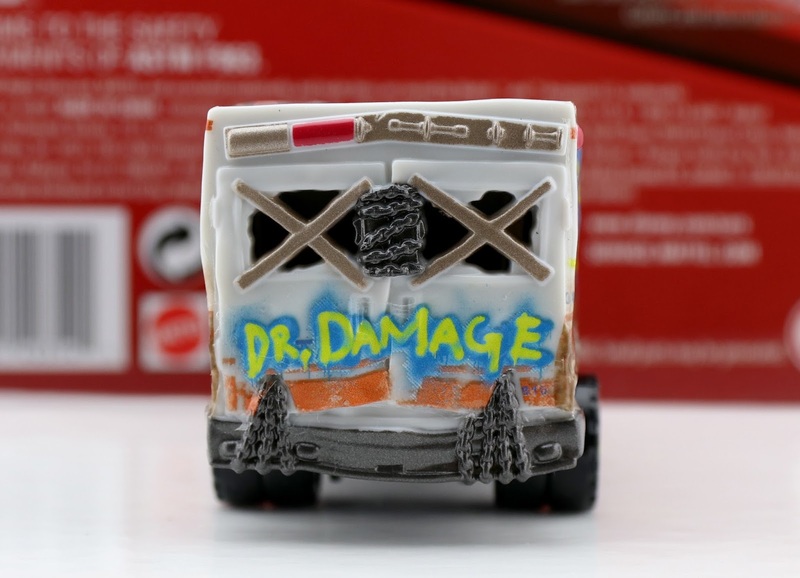 Let's take a closer look at Dr. Damage out of the package! He really looks great. One thing to note is that he's not 100% diecast metal. 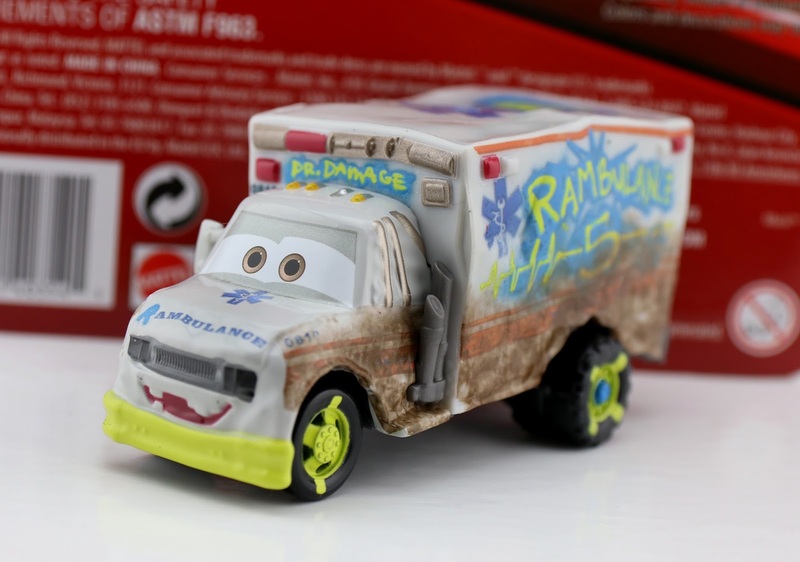 The front "face part " (for lack of better wording) of him is, but the whole back portion of the ambulance, as well as the tires and exhaust pipes, is plastic. That's not necessarily a bad thing, unless perhaps you were going to purchase this with expectations that he was completely made of metal. 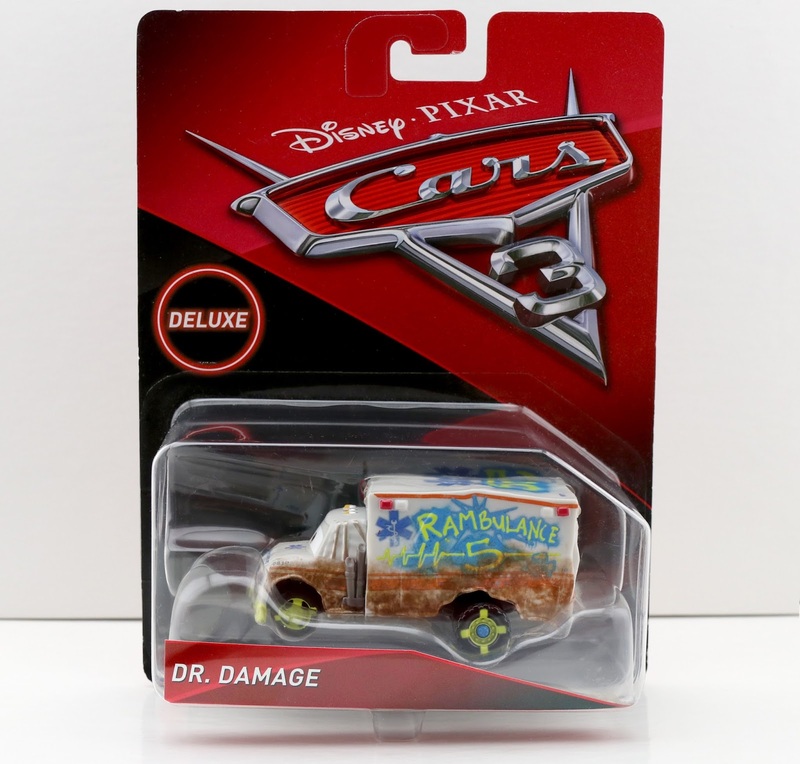 As of right now, this single carded release of Dr. Damage is the only way to get him. If you're any kind of Cars 3 diecast collector, this one is a must have for sure! At this point he may be hard to find in stores (since he started hitting shelves months ago), but it wouldn't hurt to check your local Walmart, Target or Toys R Us for availability. If you'd rather just snag him online, check out current eBay listings HERE or Amazon using the direct link below.